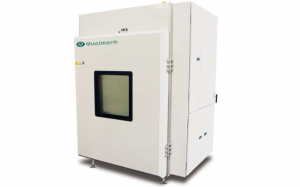 The Qualmark Typhoon 3.0 is specifically designed to help the customer who is performing low volume HASS and needs a chamber with a 36” x 36” vibration table. It is also ideal for performing HALT on mid-sized and larger products. Like our Typhoon 4.0, the Typhoon 3.0 vibration table mounts at two different heights, so the interior chamber volume can be adjusted for the needs of the product. The Qualmark Typhoon 3.0 includes the xLF2 vibration table and 14-bit controller meaning you’ll be breaking products in record time. This model is particularly well suited to system based tests where a range of products must be tested together, requiring more real-estate than single product tests. More information about Qualmark can be found on our site here, or alternatively visit their site directly here.